Download the full report to see the report card on these companies. We can all do our part to help make a difference in what is in our cosmetics and personal care products. Take a few minutes to join Environmental Defence in lobbying for change. Let’s get toxic chemicals out of cosmetics! 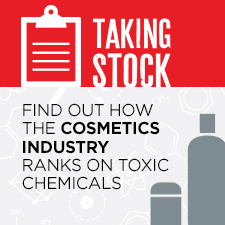 Tell cosmetics companies to remove all toxic chemicals.